Everyone deserves a whiter, brighter and healthier smile. In the past, having pearly whites meant expensive in-office whitening treatments or awkward at-home applications. 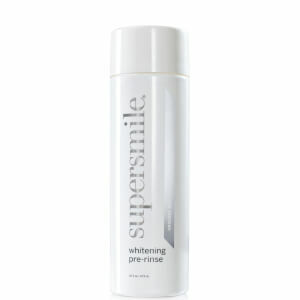 Today, Supersmile offers effective, affordable whitening alternatives. 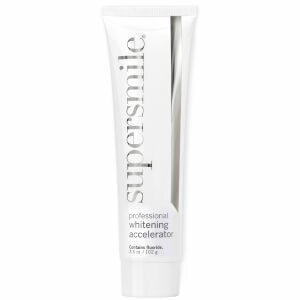 Created by the father of aesthetic dentistry, Dr. Irwin Smigel, Supersmile boasts scientifically advanced whitening ingredients. 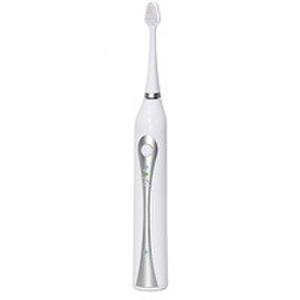 This includes the patented Calprox technology, which safely lifts surface stains from teeth by removing the protein pellicle, the film that bacteria and plaque adhere to. 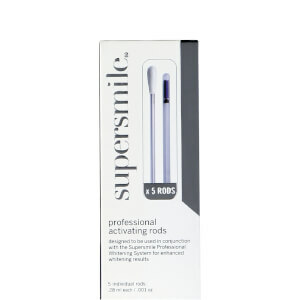 Offering an impressive variety of convenient, fast-acting products, the entire Supersmile line works on all types of teeth: natural teeth, veneers, teeth with braces, caps and dentures. Whitening toothpastes might be a staple in toothpaste aisles nationwide today, but this innovative concept started with one brand: Supersmile. The company launched in 1987, and a whitening toothpaste that founder Dr. Irwin Smigel first made exclusively for his patients helped to create a brand that has since become the Number One Whitening System recommended by cosmetic dentists nationwide. 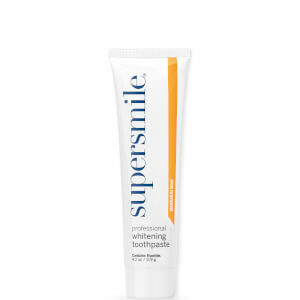 Although whitening toothpaste gave Supersmile its start more than two decades ago, the company has now expanded its product line to offer a variety of products to brighten your smile. 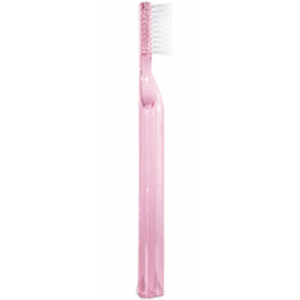 Supersmile recognizes the importance of effective dental hygiene and wants to educate its customers in addition to providing them with whitening products. Proper oral care varies for every individual, some people might face conditions such as gingivitis, while others might have sensitive teeth that do not respond well to many whitening treatments. Understanding more about these conditions is made simple by Supersmile, helping its customers discover the right products for their unique needs. In addition to offering important customer education, Supersmile stands behind its clinically proven Calprox technology, a safe alternative to other harsh whitening treatments on the market. 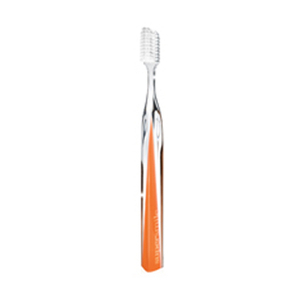 In fact, Supersmile prides itself in the fact that Calprox, while innovative, remains gentle on your teeth. You want a whiter and brighter smile, but not at the risk of your overall oral hygiene. When you choose Supersmile, you can discover the benefits of effective whitening without any discomfort or damage. 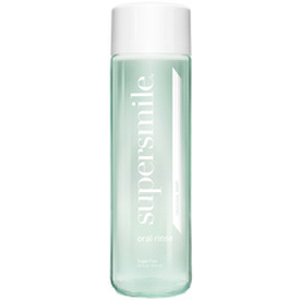 Check out the line of Supersmile products available at SkinStore to find the right ones to add to your daily dental hygiene routine today. Dr. Irwin Smigel is the brains behind Supersmile Products, which effectively whiten your teeth in the comfort of your home. You will no longer need expensive professional whitening treatments. With Supersmile Products, you are using the patented Calprox technology to safely and effectively lift surface stains from your teeth. 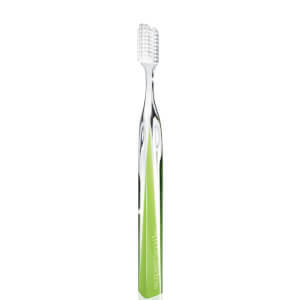 These gentle products work on natural teeth, veneers, as well as teeth with braces, caps, and dentures. 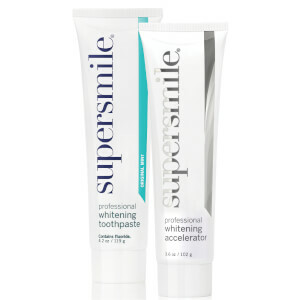 The array of Supersmile Products allows you to whiten no matter your dental needs. You can use toothpaste, floss, or a professional whitening system to brighten your smile. 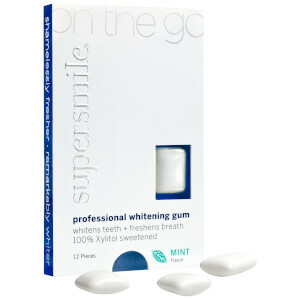 Mouth rinse and on-the-go travel packs make whitening your teeth easier than ever. Your daily dental routine can double as a whitening treatment, allowing you to eliminate daily stains and buildup to reveal a bright smile day after day. 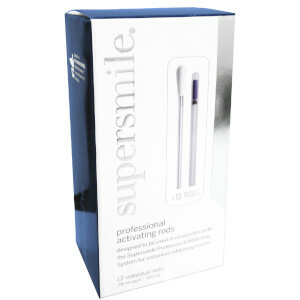 Supersmile Products are the ideal at-home whitening treatment. Discover the products that work for you to enjoy a noticeably whiter smile. A bright smile can transform your look. 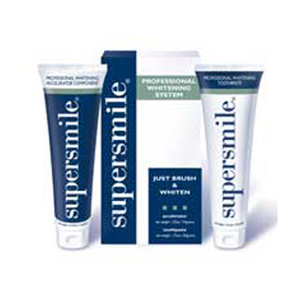 With Supersmile Products, you can whiten your teeth effectively and affordably at home. Choose from a range of product types, from traditional toothpastes to whitening travel packs or flosses, to brighten your smile, and your self-confidence. 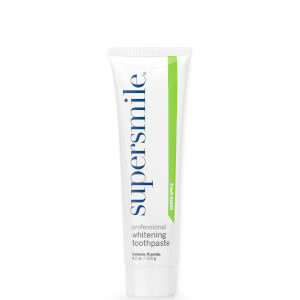 Create a brighter smile with Supersmile Original Mint Whitening Toothpaste. 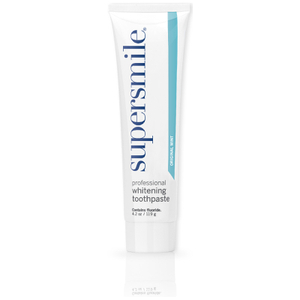 This powerful toothpaste dissolves the protein pellicle, which stains and bacteria attach to, without using harmful bleaches or abrasives. Calprox whitens your teeth, and baking soda freshens your breath. 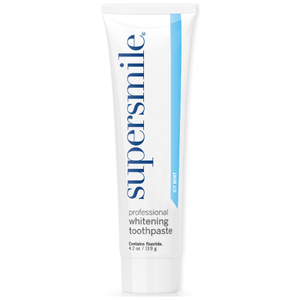 Supersmile Original Mint Whitening Toothpaste includes fluoride, recommended by the American Dental Association, to prevent cavities. 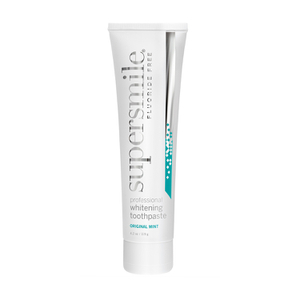 If you have surface stains from coffee, tea, tobacco, or red wine use, add Supersmile Original Mint Whitening Toothpaste to your daily dental routine. This 4.2-ounce tube will last you three months. 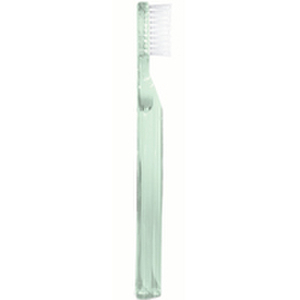 Ideally, you can brush your teeth after every meal, but realistically, that isn't always possible. 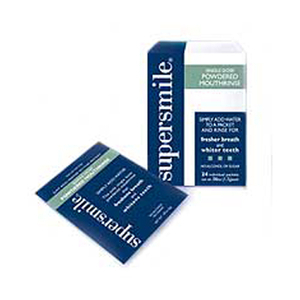 With Supersmile Single Dose Powdered Mouthrinse, you can freshen your breath and clean your teeth on the go. Just open an individual foil packet, add water, swirl, and rinse to flight plaque and stains. Baking soda freshens your breath and helps prevent cavities. This convenient rinse doesn't contain alcohol and sugar and is perfect to keep in your car, office, briefcase, or purse for daily use. When it comes to whitening your teeth, you might opt for pricey dental treatments or toothpastes that deliver questionable results. Now, you can whiten your teeth with Supersmile Whitening Floss, the world's first floss that includes Calprox to whiten your teeth. 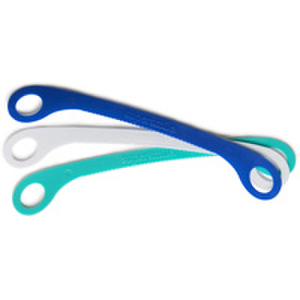 This innovative floss allows you to whiten those hard-to-reach spots in between your teeth. You can eliminate stubborn stains and order-causing plaque under your gumline. Use daily, this 100-yard spool should last you at least three months.